An institutional arrangement that distributes welfare in a transboundary river basin is described. A hydro-economic model is used to allocate water resources, water users pay for water and the totals of these water charges are equitably redistributed through a sharing rule developed using an axiomatic approach. The technique may ensure economic efficiency and lead to more equitable solutions in the sharing of benefits in transboundary river basins. A review of green- and blue-water resources and their trade-offs for future agricultural production in the Amazon Basin: what could irrigated agriculture mean for Amazonia? We apply the green- and blue-water perspective to Amazonia's water resources to highlight trade-offs that may arise with future land use change. We question how future irrigation may supply additional water vapour to the atmosphere with growing agricultural production. Maintaining precipitation recycling could prevent degradation of rainfall-dependent terrestrial ecosystems and has the potential to minimize blue-water trade-offs between up- and downstream water users within the Amazon Basin. The widely used Budyko framework is by definition limited to steady-state conditions. In this study we analytically derive a new, two-parameter formulation of the Budyko framework that represents conditions under which evapotranspiration exceeds precipitation. This is technically achieved by rotating the water supply limit within the Budyko space. The new formulation is shown to be capable to represent first-order seasonal dynamics within the hydroclimatological system. In this study we investigated the sensitivity of a large-domain hydrological model for spatial and temporal resolution. We evaluated the results on a mesoscale catchment in Switzerland. Our results show that the model was hardly sensitive for the spatial resolution, which implies that spatial variability is likely underestimated. Our results provide a motivation to improve the representation of spatial variability in hydrological models in order to increase their credibility on a smaller scale. We statistically modeled surface water extent (SWE) and inundation dynamics from a unique Landsat-based time series (1986–2011) for Australia's Murray–Darling Basin as a function of river flow and spatially explicit time series of rainfall, evapotranspiration and soil moisture. We present a data-driven and transferable approach that allowed us to model SWE through periods of flooding and drying for 363 floodplain units and to identify local combinations of variables that drive SWE dynamics. Studies show that young people have difficulties with correctly understanding groundwater. We designed a multimedia learning program about groundwater and tested its learning efficacy with pupils and teacher-training students. A novelty is the theory-guided designing of the program on the basis of hydrogeology and science education. The pupils and students greatly benefited from working through the multimedia learning program. This paper contains a new two-step method to construct fuzzy numbers using observational data. In addition an existing fuzzy neural network is modified to account for fuzzy number inputs. This is combined with possibility-theory based intervals to train the network. Furthermore, model output and a defuzzification technique is used to estimate the risk of low Dissolved Oxygen so that water resource managers can implement strategies to prevent the occurrence of low Dissolved Oxygen. Rangelands, from grasslands to woodlands, cover much of the earth. These areas face great pressure to meet growing water needs. Data on large-scale dynamics that drive water planning remain rare. Our watershed-scale results challenge simplistic hydrological assumptions. Streamflow was resilient to dramatic landscape changes. These changes did shape sediment yield, affecting water storage. Understanding these processes is vital to projections of rangeland water resources in a changing world. The AWAT (Adaptive Window and Adaptive Threshold) filter routine for high-resolution lysimeter data is improved. The threshold scheme with original step interpolation yields unrealistic fluxes for high temporal resolution. Improvement applies linear and spline interpolation schemes so that fluxes in high temporal resolution are automatically calculated. The spline scheme allows continuous differentiability of filtered data so that any output resolution for the fluxes is sound. This paper presents a novel system to issue heavy rainfall alerts for predefined geographical regions by evaluating the sum of precipitation fallen in the immediate past and expected in the near future. In order to objectively define the thresholds for the alerts, an extreme rainfall analysis for the 159 regions used for official warnings in Switzerland was developed. It is shown that the system has additional lead time with respect to thunderstorm tracking tools targeted for convective storms. In arid areas, stream–aquifer water exchange essentially sustains the growth and subsistence of riparian ecosystem. To quantify this effect for intensity and range, a stream–riverbank scheme was incorporated into a state-of-the-art land model, and some runs were set up over Heihe River basin, northwestern China. The results show that the hydrology circle is significantly changed, and the ecological system is benefitted greatly by the river water lateral transfer within a 1 km range to the stream. In this paper, we present a meta-analysis of nitrate contamination in groundwater at the pan-African scale. A nitrate data set is constructed based on publications in the web of sciences, and combined with high-resolution generic spatial environmental attributes. A statistical model explains 65 % of the variation of nitrate contamination in groundwater in terms of generic spatial attributes. Nitrate contamination of groundwater at the pan-African scale is mainly affected by population density. Runoff thresholds for activating flood warnings might be estimated with regionally derived relationships between catchment descriptors and assigned flood quantiles. Since the consequences of overestimated thresholds (leading to missing alarms) are generally more severe than those of an underestimation (leading to false alarms), the work proposes to parameterise the regression model with an asymmetric error function, instead of using a traditional, symmetric square errors sum. We comment on "Using groundwater age and hydrochemistry to understand sources and dynamics of nutrient contamination through the catchment into Lake Rotorua, New Zealand" by Morgenstern et al. (2015). They propose that "the only effective way to limit algae blooms and improve lake water quality in such environments is by limiting the nitrate load". We outline four reasons why it is important to instead limit both phosphorus and nitrogen loads to this iconic lake, consistent with current policy. The drought recovery of the soils in Neotropical Andean grasslands above 3500 m a.s.l. known as "páramo" was studied in this paper. The main aim was to estimate the recovery speed of the páramo soils after drought periods. A typical catchment on the páramo at 3500 m a.s.l. was compared to a lower grassland one at 2600 m a.s.l. The study revealed that, at the plot scale, the soil moisture drought recovery was higher in the páramo. At the catchment scale, however, was not as pronounced. An experimental seasonal hydrological forecasting system is established over the Yellow River basin to provide adaptive support in a changing environment. The system consists of downscaled NMME climate prediction, hydrological models calibrated against naturalized streamflow along the mainstream, and a post-processor to account for the human interventions implicitly. As the first paper of a two-part series, this paper investigates the hydrological predictability by using reverse ESP simulations. This paper evaluates the added value from climate forecast models over the Yellow River basin. Without considering the errors in hydrological models, the climate-model-based seasonal hydrological forecasts show higher skill than the climatological forecasts, especially during the rainy season. The improvement decreases especially at short leads when the post-processed forecasts are verified against observed streamflow, and the added value mainly exists in the transition from wet to dry seasons. Characterizing rainfall erosivity in the Fukushima fallout-impacted region is important for predicting radiocesium behavior. The majority of rainfall (60 %) and rainfall erosivity (86 %) occurs between June and October. Tropical cyclones contribute 22 % of the precipitation though 44 % of the rainfall erosivity. Understanding the rainfall regime and the influence of tropical cyclones is important managing radiocesium transfers in contaminated catchments in the Fukushima prefecture. Standardised meteorological indicators are widely used in drought monitoring, but applications to hydrological drought are less extensive. Here we assess the utility of standardised indicators for characterising drought duration, severity and propagation in a diverse set of 121 UK catchments. Spatial variations in streamflow drought characteristics reflect differences in drought propagation behaviour that are themselves largely driven by heterogeneity in catchment properties around the UK. To help geo-scientists prepare for TV appearances, we review the scientific literature on effective science communication related to TV. We identify six main themes: scientist motivation, target audience, narratives and storytelling, jargon and information transfer, relationship between scientists and journalists, and stereotypes of scientists on TV. We provide a detailed case study as illustration for each theme. This paper presents simulations of all of the processes involved in a potential GLOF originating from Lake Palcacocha above the city of Huaraz, Peru. The chain of processes starting form an avalanche falling into the lake and leading to a possible GLOF are simulated and converted into flood intensity and hazard maps (based on an intensity-likelihood matrix) that may be useful for city planning and regulation. Erosion from the overtopping wave did not result in failure of the damming moraine. We present a three-parameter streamflow elasticity model as a function of precipitation, potential evaporation, and change in groundwater storage applicable at both seasonal and annual scales. The analysis of the modified equation at annual and seasonal scale indicated that the groundwater and surface water storage change contributes significantly to the streamflow elasticity. 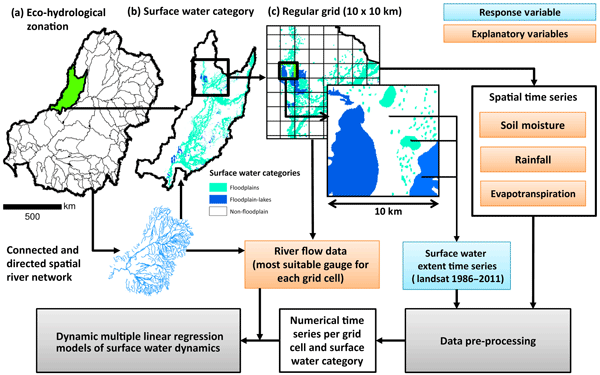 The objective of this study is to improve the reliability of large-scale hydrological models. In environmental policies, many decisions are based on prognosis simulated by models. The parameterisation of these models is challenging due to the scarcity of available data. Particularly, parameters of soil properties are rare, but have a strong influence on model results. To account for the heterogeneity of soil properties, we developed a methodology that does not need additional field data.